I've been blogging since 2008, but started The Stylish Housewife in 2010. What were the main reasons you started a blog? After having my son, I decided to quit my job in the financial services industry to become a stay at home mom. I found myself getting WAY too comfortable hanging out in my pajamas/workout clothes (even though I was NOT working out at the time...lol) and decided I needed to do something to motivate myself to dress up more often. And so The Stylish Housewife was born. After spending a few years in NYC & LA, it took some getting used to dressing down again for my casual beach-ish town but I am always inspired by BIG city fashionistas! I also love flipping through my fave mags for outfit inspiration and of course, my fellow style bloggers are always keeping me inspired to try new things! I recently joined stroller strides (wow, I sound like SUCH a mom) and I am ADDICTED. It is a great workout plus we get to socialize with other moms & kiddos! I am also a nail polish addict so I can often be found rearranging my nail polish collection. KIDDING...but I do paint my nails quite often. How long have you lived in San Diego? Tell us what you love about SD. I am born and raised in Southern California. I graduated from Carlsbad High School and spent most of my younger years in Encinitas. Then at 30 years old I picked up and moved to NYC. After that I lived in LA briefly before coming back home to the Encinitas area. All of my family and friends live here so I can't imagine raising a family anywhere else! There's no place like home. 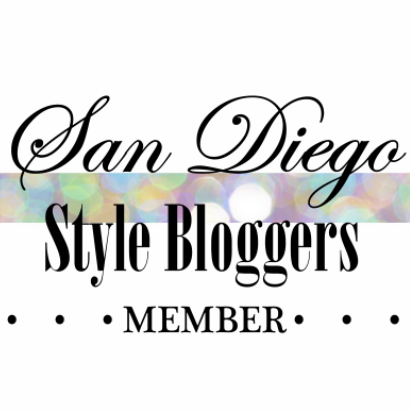 *If you are a Style Blogger in San Diego and would like to be added to our blogroll and/or be featured, email us at SDStyleBloggers@gmail.com for more info! I love your style, Jenn! The bright blazer, striped skirt and pink dress are calling my name... :) I too am inspired by BIG city fashion, so I love getting to know another SD blogger who loves to dress it up a bit! Can't wait to meet you at the event! I love Jenn's blog and I love that she's so mom yet so stylish! First San Diego Style Bloggers Event!